Like RaeCole's Coffee Bar on Facebook! 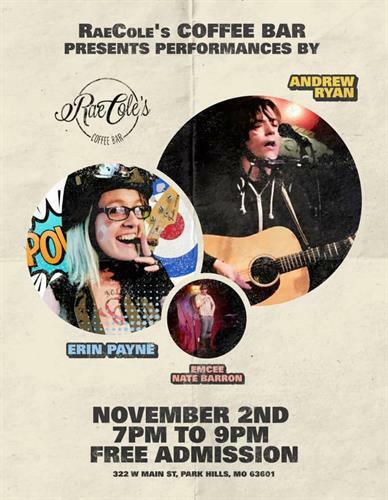 RaeCole’s Coffee Bar presents Andrew Ryan and Erin Payne. LIVE MUSIC at the coffee bar to kick off our upcoming open mic nights. This is a FREE concert open to the public. No reservations will be taken so arrive early to reserve a table. Emcee: Nate Barron.